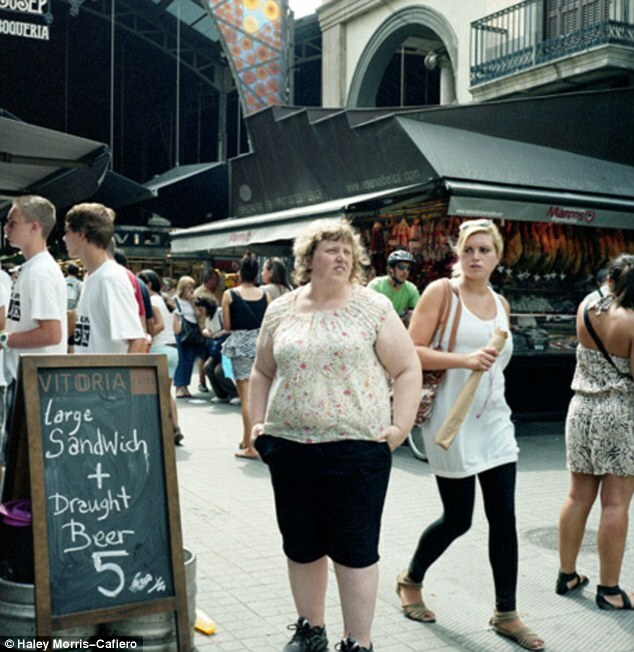 A friend of mine linked me this article yesterday from the Daily Mail: Obese woman’s revealing photography project exposes the cruel and judgmental stares she attracts from people on the street. The article is about an artist, Haley Morris-Cafiero who goes around taking pictures of herself in order to document people looking at her in the background. The premise here being that, because she’s overweight, people are being “cruel” to her behind her back by, apparently, giving her judgmental stares. While the article and her website where you can view the whole project are meant to reveal something about our wider culture and the insidious presence of fat-shaming, I was actually struck by what the whole thing said about the woman herself and how much of what we think about other people is actually a reflection of what we think of ourselves. Glancing through the photo collection, one sees Haley in various settings taking sometimes-posed and sometimes-candid photos of herself. She writes, “I seek out spaces that are visually interesting and geographically diverse. I try to place myself in compositions that contain feminine icons or advertisements. Otherwise, I position myself and the camera in a pool of people…and wait.” The goal being to, as she says, “reverse the gaze” and capture people staring at her. But while the project, again, seeks to reveal something about the onlookers it really reveals much more about the subject herself. She says that “I have always been aware of people making faces, commenting and laughing at me about my size. I now reverse the gaze and record their reactions to me while I perform mundane tasks in public spaces.” In the pictures she has on the website, which we have to assume are the most representative of this phenomenon, you’ll see people in the background looking at her… but are these really “cruel and judgmental” stares? Are people really “gawking” at her or “sneering” at her? Much less because of her weight? But because, as she says, she has “always been aware of people making faces, commenting and laughing” at her, when people look at her she reads them as seeing one thing: that she’s fat. Her lens for seeing herself gets projected onto other people and because she expects people to glare at her, she sees them glaring at her. Because, like all of us who have struggled long-term with our weight, we glare at ourselves: we get the love we think we deserve. We expect other people are giving us the same critical eye that we give ourselves. This is an important thing to keep in mind when we are thinking about how we interact with others. If we see ourselves as fat and internalize that as essentially part of who we are, then we will tend to think that others see us that way and only that way. It is easy to project our anxieties onto the outside world and read every interaction as though it has something to do with our weight. The stronger our anxiety about the weight, the stronger our tendency to jump to conclusions and say, “it’s because I’m fat.” But the truth is that people look at other people… duh. It isn’t automatically a judgmental stare at your fat body. And people laugh all the time… if they’re in earshot of you, it isn’t automatically because they’re making fat jokes about you. And people stare and give goofy looks sometimes… maybe it’s less because you’re fat and more because you’ve set up a camera on a crowded street to film you doing nothing. This expectation that “everyone is looking at me” is actually a pretty interesting kind of narcissism. No: not everyone is looking. This entry was posted in Mentality and tagged body type, lifestyle, obesity, psychology, society, truth by romaneski. Bookmark the permalink.